Goodie goodie gumdrops, check out the Paint By Numbers collection by Matilda Jane Clothing. I was tickled pink when MJC contacted me to ask if they could send me a few things and would I write a review... um yes, please. 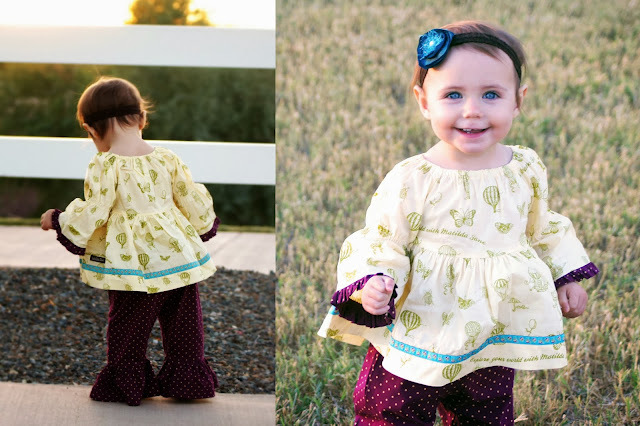 In these photos, Penelope is wearing the Limelight Peasant Top and Pointillism Big Ruffles pants. Adorable, right? If I was clever I might come up with a name for this photo shoot, like Little Girl Exploring in the Fall but more pithy. This ensemble, and all Matilda Jane pieces are just perfect for Fall family photos (did someone say Christmas Card), especially for families with lots of daughters! I found Penny's outfit to be soft and well-constructed and, albeit ruffly, very practical. Photo shoot aside (I was playing with a new camera lens, so fun), Penny is going to wear this ensemble to our cousin's baby shower in a few weeks. A note on sizing... Penny is almost fifteen months old and is wearing a size 12mo, and the pants and shirt are HUGE on her. The good news is, she can wear them all through the winter without outgrowing... But keep this in mind as you shop for your littles. I got the Tawny Birch Tee, Butterfly Pants and (my favorite, the) incredible black Daybreak Cardigan sweater (outfit on the right). 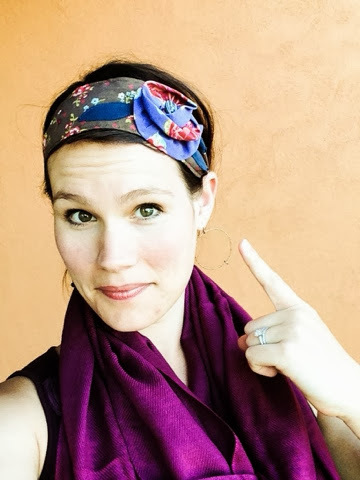 Oh, and this Nancy in Chocolate headband (left), what do you think? I've never worn headbands before. 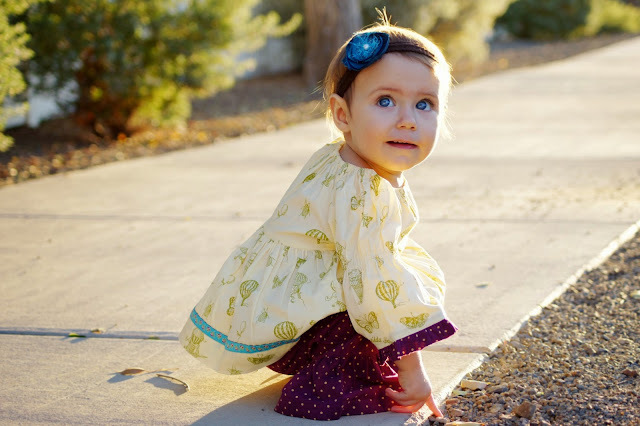 Penny inherited a few Matilda Jane Clothing items as hand-me-downs from sweet cousin Hope, and I've always loved their whimsical girly style, but never knew where the store was. Now I know, you've gotta find a Trunk Keeper in your area and buy the items through them. It's kind of like an underground boutique of girly goodness. Also, now I know they have grownup clothes too. If you live near me in the Phoenix area, I've already tracked down a seller near us. If not, you can find one through the website, easy as (storebought) pie. [insert shameless plug] And totally optional, you could always follow me on Instagram or Bloglovin' or subscribe to Becoming Julie Griffin using links on the right... I mean, that's if you wanna keep up with me and Penny and Dan and our shenanigans this fall. I will select a winner at random on Saturday October 19th! Good luck! 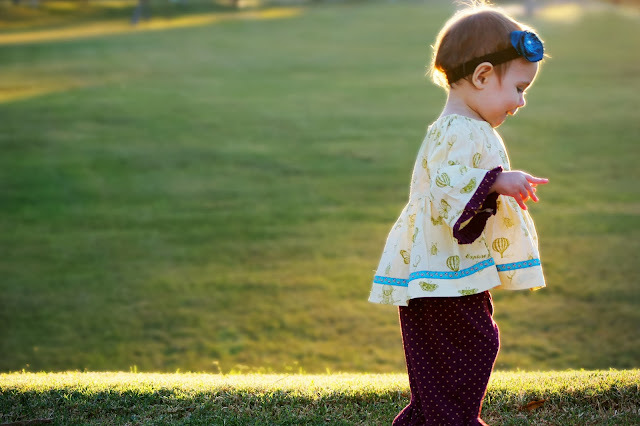 I'll take the Quiet Green Tiered Dress with the Doodle Leggings, and lets also add the adorable Nancy in Burgandy or Chocolate headband. And yes, that headband looks super cute on you. oh Hope in the doodle leggings... so perfect. Good luck! Reagan would love the Calypso dress. I love the pink in that one. It would be adorable on her! Good luck! The Plum Kitten Cardigan! Love the pictures of Penny!! The headband looks great on you! Thanks Megan! Yes, how cute is that cardigan. Good luck to you and E! Love the https://www.matildajaneclothing.com/t14153-connect-the-dots-tee and the https://www.matildajaneclothing.com/d1443-wisteria-noknot-dress. Thanks Emily! I feel so brave sporting it :) Good luck! Nieces totally count! :) Good luck. I love that dress too. Your girl looks adorable in that outfit. Yay for new readers! Welcome. I was just thinking about how good artichokes are before I clicked over to your blog (weird, right?). Good luck to you and your girls! I think Leighton would look especially sweet in the Painterly Lap Dress...and I think I could probably rock that Fairest Navy Dress! Oh she would, and good for you picking out something for yourself! Their clothes are uber comfortable too. Good luck! Hi Kelsey! Welcome! thanks for sharing, and good luck! That tunic is great. Their adult clothes are very comfortable. My daughters first birthday is quickly approaching and it's hot air balloon themed! The wisteria no knot or the limelight peasant would be perfect!! OMG hot air balloon birthday party... the cuteness. Good luck! And welcome! I would love any of the new paint by numbers outfits for my gal :) I just discovered MJ and I am in LOVE! I love the painterly lap dress, the copper cardigan, and the Daybreak cardigan!